About 500 years ago, in the twilight of the period we call the Renaissance, there began to appear near the coast of the Northern Adriatic around the present city of Venice, Italy, a group of country houses unlike any homes ever seen before. They were all within a radius of about 50 miles, and they were all the work of a single architect. Toward the end of his career, that architect used the new technology of movable type -- then about 100 years old -- to produce a four-volume illustrated catalog of his work with a commentary on his principles and methods. The book, entitled The Four Books of Architecture, stunned the European world. It revolutionized Western architecture of the 17th and 18th centuries; it produced the school of Southern architecture in the 19th century; and it remains a major influence throughout the world even today. Andrea Palladio's personal history would seem beyond the imagination of even Horatio Alger. Beginning as a 13-year-old apprentice to a stonemason, he grew up to become the sought-after companion of aristocrats and intelligentsia, as well as the political, military and business leaders, of his day -- the dominant figure in his field, not just in his own lifetime, not just in the lifetime of those who knew him, but now -- more than 400 years later. What can explain this? It seems to me that there's only one possible explanation, namely, that he did just what he set out to do: From his studies of the past and his analysis of contemporary needs, he did in fact distill timeless and universal principles. Let us begin by looking at the needs of his time. In Palladio's time Venice was not just a city. It was the center of a vast empire with military and commercial enclaves all around the Adriatic and Eastern Mediterranean. In fact, at its height, Venice was one of the greatest military and commercial powers on earth. In population, four times the size of Rome and London combined. Venice's power came from the fact that its forces stood astride both of the great East-West trade routes of the day: the Northern or land route to Asia and the Orient, and the Southern or sea route. Venice rose to power in the 1100s by developing an advanced system for constructing war galleys. In fact, Venice originally was entirely a sea power. Based on a group of small islands in an Adriatic lagoon several miles from the mainland, the mighty Venice had no land at all on the Italian mainland until the mid 1300s. Military expansion on the Italian mainland then continued until the early 1500s. By then three dramatic events had set in motion a land rush for the vast undeveloped areas of the European mainland west of Venice. First, the Ottoman Turks, who had for decades been nibbling away at Venezia's eastern outposts, in 1453 stormed and captured Constantinople, the great Christian city of the eastern world, the massive capital of the long-faded Eastern Roman Empire. This and related developments effectively clipped Venice's already withered control of the land route to Asia, and put its sea route under great pressure as well. Second, in 1492 the Spanish expedition of Christopher Columbus discovered the Western world, which in ensuing years rapidly replaced the Orient as the most lucrative destination of European traders. Third and finally, in 1497 Vasco da Gama of Portugal demonstrated a new sea route to Asia by sailing around the southern tip of Africa and across the Indian Ocean. Now the merchants of Western Europe no longer had to pay Venice for safe passage to the East. In just 44 years the Mediterranean Sea -- Medi-Terrano, the center of the earth for thousands of years -- went from being the center of the earth to the center of very little. Fortunately, after hundreds of years of fighting, peace had broken out on the mainland. The mainland areas near Venice finally had the security necessary for large-scale agriculture and for transporting those harvests to the population centers. At the same time, to pull these elements together, there was a class of entrepreneurs with the capital to clear the fields, drain the swamps, organize the farm centers. These were the noble families of Venice. They had amassed their fortunes in foreign trade, in shipping, and -- surprisingly for a sea-going class -- in agriculture: Huge plantations in Crete, in Cyprus, and elsewhere through their overseas empire. Now they could put their capital and their overseas agricultural experience to work close to home. "[B]y exercise, which one can take in the country on foot or on horseback, they will preserve their health and their strength, and there finally their spirits, tired of the agitation of the city, will take great refreshment and consolation, and they can attend quietly to the study of letters, and contemplation -- as for that purpose the wise men of old times used often to follow the practice of retiring to similar places, where they were visited by good-hearted friends, and their kin . . . ."
But where were these noble families to stay in the countryside? Mud huts wouldn't suit. They needed a magnificent home, something that reflected their own magnificence and virtue. But it wouldn't do just to build a Venetian palace out here in the countryside. That sort of building wouldn't be functional -- suited to the business of supervising a large agricultural establishment, or storing the grain and wine produced. That kind of urban building wouldn't facilitate the communication with nature that the man of virtue requires for repose and contemplation. And perhaps most important, that kind of building would cost an arm and a leg. Something entirely new was needed. Something magnificent, but inexpensive. Something comfortable, restful, yet at the same time functional as the center of activity for dozens of farm workers. Fortunately, a certain stone mason in Vicenza -- about 60 kilometers from Venice -- was waiting with the answer. Moreover, it turned out that the problem posed was not unique to Venice. It turned out to be the central problem at the intersection of modern architecture and modern economics. Therefore, Andrea Palladio's solution has been the cornerstone of architecture ever since. Remember the problem: The need for a structure that is magnificent, yet inexpensive; comfortable, yet functional. 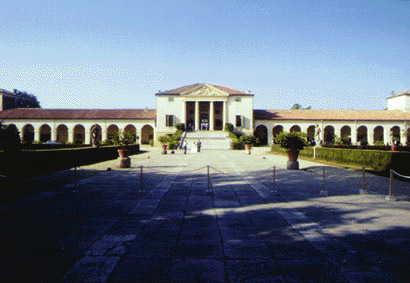 Palladio ultimately developed three primary types of exterior elevation that we have come to characterize as Palladian. The simplest, most modest and most numerous among the constructed works, Type I (as I will call it), presents a loggia pierced by three openings. The second, Type II, borrows the Greek temple front. Palladio never saw the Greek monuments, but he visited Rome five times. A long and dangerous journey. There he saw, mostly in ruins, the classic public buildings of Imperial Rome -- which the Romans, of course, had borrowed from the Greeks. It was Palladio's inspiration to adapt the Greek pediment and columns to private residences -- an audacious step, and one that could only be taken by a confident architect with proud patrons. Finally, the third and most innovative and modern of the three motifs: the double-columned loggia. That is, complete columns above and below. The first motif, the three-opening loggia, appears in Palladio's very first villa: Villa Godi, which was constructed about 1540. There is a certain clumsiness to this first outing. Heavy volumes at the left and right are reminiscent of the fortress-like villas of the prior century and the early 1500s. Villa Trissino, the villa in Cricoli that Palladio's great benefactor Giangiorgio Trissino built two or three years earlier, comes to mind. There's really nothing here to inspire the architects of future centuries. At least there's nothing obvious. But I would suggest that there are a few elements here that you should begin to watch -- elements that you will see evolve and mature. First, there is symmetrical balance from left to right. This may seem a small thing -- and it certainly has many antecedents -- but I would remind you that it is a striking contrast to the unsymmetrical gothic palaces of Venice. And it becomes a cornerstone of Palladian villas. Secondly, the three-opening loggia -- certainly not a new idea either -- has been combined with other elements in a way that begins to open the villa to the world outside. Lasting peace -- at least in a relative sense -- had come to the Veneto. The great, devastating War of the League of Cambrai -- was now 30 years in the past. That fact is subtly underscored by Villa Godi. Let's consider a few more examples of this triple-opening loggia. There's less variety among these than we find in the grander villas of the second and third motifs, although he sometimes elaborated the three openings with a Serliana motif. Villa Pisani at Bagnolo (probably incorporating an earlier tower on the left), Villa Caldogno, Villa Saraceno, Villa Gazzotti -- are all substantially similar, and modest in their exterior motif. But a comparison of Villa Saraceno, for example, and Villa Gazzotti shows a fascinating element beginning to emerge at Villa Gazzotti: the pillars of the loggia begin to metamorphose toward classical columns supporting a pediment! At Villa Gazzotti the "columns" are only pilasters, but clearly a pediment of the Greek style is beginning to emerge atop a traditional Italian motif. Not yet the dramatic classical adaptation found in Palladio's great works, but a suggestion of the future. The story turns dramatically when we move to the true temple-front examples. Now we are moving to the great homes in the history of architecture. 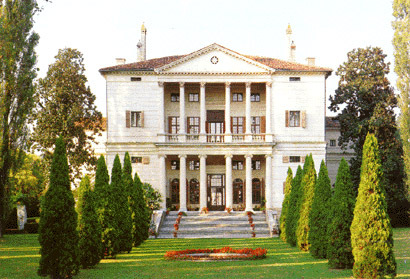 At Villa Barbaro in Maser we see one of Palladio's most magnificent and influential designs. Influential in a whole range of ways. First, we see the true Greek temple-front. Not projecting forward in this example, but surmounted by a brilliant classical pediment. What chutzpah! This is the design for the front of a temple. Palladio and the proud patricians of Venice have had the self-confidence to put it on the residence of a mere mortal. Of course, to keep things in perspective, the temple/villa is flanked by adjoining farm buildings for storing grain and wine and for housing farm animals. The Venetians call these farm buildings "barchessas." At the ends of the barchessas Palladio added dovecotes on top and faced them with sundials. The result is one of the lasting legacies of Western public architecture: the so-called 5-part profile. Count the parts from left to right: 1-Left Dovecote; 2-Left Barchessa; 3-Residence; 4-Right Barchessa; 5-Right Dovecote. How many buildings have you seen based on this scheme? Start with the U. S. Capitol building. But in England there are dozens of country homes with this 5-part profile. Even American ranch-style homes frequently display this Palladian profile. Now you know where it began. 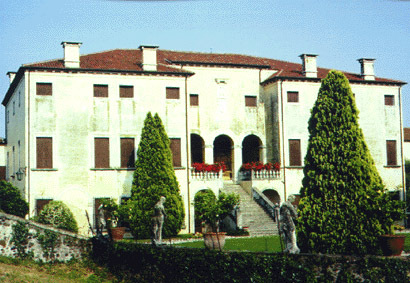 Here's another example of the 5-part form: Villa Emo at Fanzolo. The dovecotes on the ends are less prominent here, but look at the temple front. Now the columns are free-standing. Where could this evolution go next? 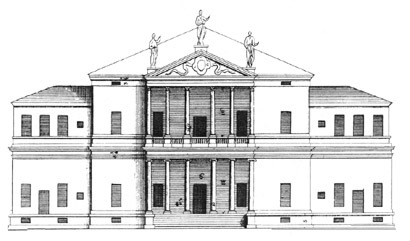 Palladio moved ahead to his third major motif. Not one loggia, but two loggias, one on top of the other. The garden side at Villa Cornaro shows this motif in its simpler form, with the loggia recessed within the central core of the villa. It's a place to sit and look from a protected area out into the world. 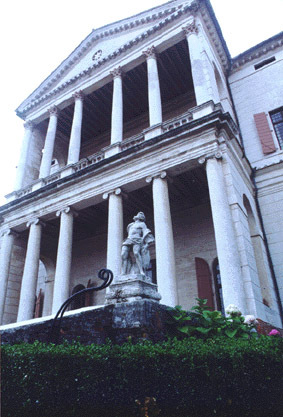 But Villa Cornaro is one of Palladio's double-faced villas, and the street side brings the grand culmination of the evolution of Palladio's exterior motifs. It's the leap to the modern world! Suddenly the "rooms" are not buried in the core and looking out at the world. Now the rooms are thrust out into the midst of the world! What a break with the past! The first appearance in architecture of projecting double-columned loggias with architrave and pediment. Think how far things have come. 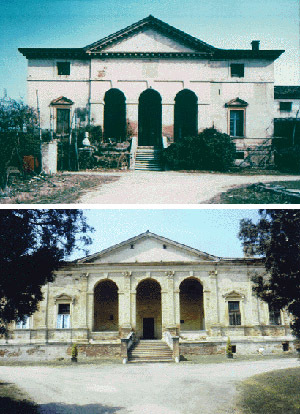 Compare this bold villa-as-part-of-the-world with the glum defensive Villa Godi with which Palladio began. This must be one of Palladio's greatest achievements. Perhaps he was inspired in some way by Villa Giustinian about 40 miles away in Roncade. But essentially we have here a most unusual event: a completely new idea. Here is the first example of this motif ever built. Hard to believe, because now it seems so common. I think of it as being like the invention of calculus. A device to be used throughout posterity. So much for Part I of Palladio's solution: the dramatic exterior motifs. Part II of the solution, you will recall, was the use of economical materials. As you know, the palaces of Venice itself are built of stone brought from distant mainland quarries. The stone was then usually clad in marble from Istria or beyond. But because Palladio had achieved his visual impact through his design motifs, he could build his villas of brick instead of stone, and clad them in stucco instead of marble. Surprised? Yes, you probably thought these magnificent villas we've been seeing were built of granite. But now you know their nasty secret: brick. Brick and stucco. 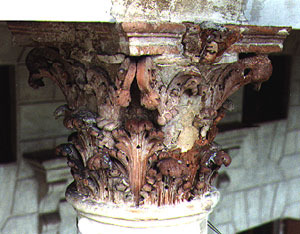 Even the ornate capitals hold a secret: terra cotta. At least on the sunny south side; on the north facade the capitals might be stone because of the weather. Terra cotta! Can you believe those capitals are like 450-year-old flower pots? The architraves supporting these mighty pediments? Wood! Wood covered with straw lathing and then stucco. Now let's move inside. If you've visited inside any of the palaces of Venice itself, you may have noticed that the walls are bare although the cornices and ceilings may be magnificently decorated. The missing element today is the tapestries. In the 16th century the palace walls were covered in magnificent tapestries -- both for their beauty and for their insulating qualities in the winter. Now, since the villas out in the countryside were only for use in the summer farming season, the insulating qualities were not needed for warmth. So, if the walls could be decorated some other way, the huge cost of tapestries could be eliminated entirely. Frescos were the answer. Did you ever for a minute imagine that the magnificent frescos of the villas were a cost-cutting device? If you didn't mind going down-market, you could hire Veronese or Zelotti to stop by for a month or two and give you some imitation tapestries and columns and statues. 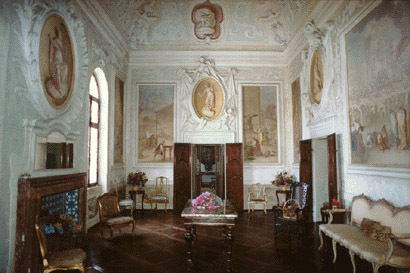 In fact, only the Cornaro family -- the richest family of the Republic -- seems to have resisted the temptation; their villa at Piombino held out for the real thing: real columns, real niches, real statues -- not cheap imitations by Veronese. This brings me to the last, the least understood, and the most evanescent element of Palladio's solution: Palladio's interior harmony and balance. It's the difference between Palladio himself and Palladianism. His exterior motifs -- innovative as they are -- can be copied. His economical materials can be duplicated, even improved. (Thank God Palladio didn't know about styrofoam!) 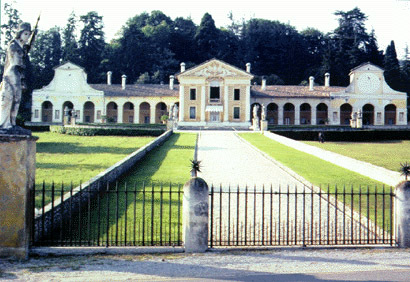 But Palladio's balance and harmony seem to live only in his 18 surviving villas of the Veneto. 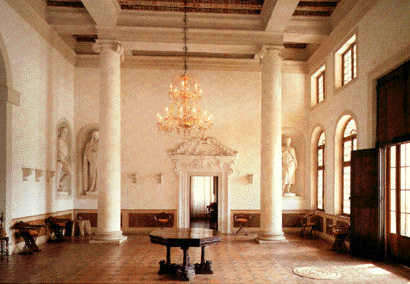 The harmony and balance of Palladio's interior spaces is their great epiphanal triumph -- but it seems to elude the Palladians of other countries and later times. Palladio certainly tried to conceptualize and convey his insight. But perhaps it's like analyzing the success of the Mona Lisa in order to duplicate its effect in another painting. First, and fundamentally, Palladio states that the parts of a house must correspond to the whole and to each other. This seems simple in theory but has proved nearly impossible for most of posterity's Palladio wannabes. Standing in one of Palladio's villas -- and I mean standing anywhere in it -- you have at all times a sense of where you are within the total structure. To use a currently fashionable term, the concept of the floor plan is transparent. Compare that with a large modern house where you never know what twist or turn or size or shape of room may lie around the next corner. Secondly, Palladio varies the volumetric size of his rooms with the creativity and discipline of a Bach fugue. His inspiration here is said to have been the Classical Roman baths with their rooms on three scales. Finally, as to the shapes of individual rooms, he offers up a smorgasbord of possibilities, from the square and the circle to rectangles in a variety of ratios of width to length. The ratios of width to length -- both as published in his Four Books of Architecture and as measured in the completed villas themselves -- have been the subject of a great deal of recent scholarly research with little concrete result. Rudolph Wittkower in 1949 published Architectural Principles in the Age of Humanism with his breathtaking proposition that the ratios of width to length in Palladio's rooms are based on the harmonic proportions of music. In other words, that Palladio worked on an "If it sounds good, it'll look and feel good" principle. The enthusiastic acceptance of this theory was only modestly tempered by the fact that some of Palladio's rooms reflect harmonic musical proportions and some don't. But Wittkower was right in emphasizing the importance of number theory or numerology as a foundation for Palladio's proportions. Harmonic proportion provides an insight to some of Palladio's villas, particularly the later ones, but equally or more important was the theory of "perfect numbers." The numbers "6" and "10" were deemed to be "perfect" numbers because they reflect the proportions of the human body in several dimensions, including the ratio of front-to-back and side-to-side. In other words, you would feel comfortable in a room that was in the ratio of 6-to-10 because the room would have the same proportions as your own body. Then, in a grammatical challenge, the number "16" was deemed to be the "most perfect" number, primarily because it was the sum of the other two. Now let's put all this together in an analysis of the central core of the villa I know best, Villa Cornaro. 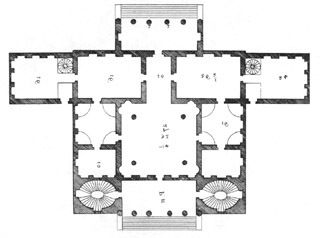 In 1570 Palladio published the floor plan as part of Plate 36, Book II, of his Four Books of Architecture. The first thing that strikes us is that the central core is one of Palladio's preferred shapes, a square. Next we notice the fugal variation of room sizes. You can't see it, of course, in Palladio's floor plan and elevation, but the heights of the rooms modulate as well. Then let's look at the proportions of one of the long rectangular rooms on the north. Now we are moving toward the central inspiration of Villa Cornaro. The ratio of length to width in the room is 3-to-5. But consider 3-to-5! That's the same as 6-to-10. Yes, this room is in the ratio of the two "perfect" numbers. You'll feel very comfortable in this room. And the actual width of this room? Sixteen Vicentine feet: the most perfect number of all. So here you are looking at Palladio's perfect room. A remarkable artefact to be sure, but remember Palladio's fundamental premise: the parts must relate to the whole and to each other. How does that work here? Well, obviously, there is another room the same size on the north. But then on both the east and west sides, there is a square room with a small room behind it. Those two rooms together repeat the dimensions of the perfect rooms on the north! Now that only leaves the large room. The relation here is not obvious, but it finally emerges. Yes, the grand salon is two of our "perfect" rooms side by side. There you have the secret to the harmony and balance of Villa Cornaro: the central living area is six repetitions of the module of the perfect room, all set within a square. But harmony and balance, like some of the finest wines, don't travel. You can transport the double projecting portico of Villa Cornaro to Drayton Hall or the Miles Brewton House in Charleston, to Shirley Plantation in Virginia, to a pleasant home on Woodward Way in Atlanta, to thousands of other homes across America. And, lord knows, you can always transport wood or other even cheaper materials. 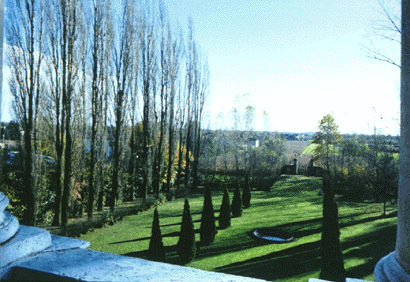 You can transfer the 5-part profile of Villa Barbaro, the occuli of Villa Poiana, or the encircling arms of Villa Badoer. 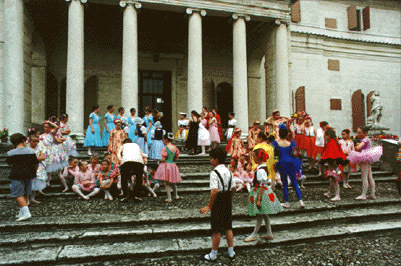 But the balance and harmony -- the balance and the harmony that are the core of Palladio -- don't travel. They can be found only in the Veneto. They don't travel, but they never age. Unfazed, unaffected by any pale imitations -- the villas live vibrantly today.
. . . As vibrant today as in the crisp, cool mornings when Palladio walked there.